All transactions are safe and secure with a reliable history in online purchasing behind each of our associates. Buy the Cars Guido t-shirt to own Cars clothing and merchandise. Providing a certain amount of the comic relief in the Cars movie, Guido is a forklift who works with Luigi at Casa Della Tires. The two are also best friends. The forklift Guido dreams of one day working the pit crew for a real racecar. His dream comes true when he works as part of Lightning's pit crew for the tiebreaker race, performing the fastest pit stop in Piston Cup history. This was after Chick Hicks pit crew had made fun of Guido. This Cars t-shirt celebrates the little forklift that could. 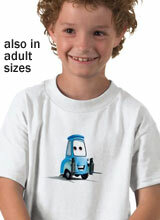 Pair it with related Pixar Cars shirts to celebrate the movie. In addition to the Cars Guido tee above, browse the Cars Clothing Gallery for more apparel like men's and women's clothes, kids shirts or hoodies.